What should we do after deleting important files on Windows 7? You might say restoring them back from Recycle Bin. Well, that’s correct. However, what if you deleted Windows 7 files permanently? Don’t doubt it. This kind of issues happen on people from time to time, but no need to worry. 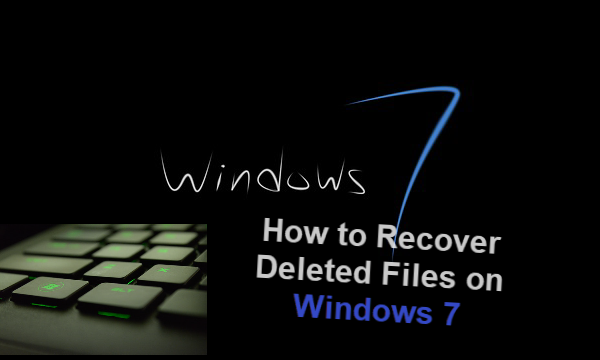 In this article, you will know how files are deleted from Windows 7 and how to recover deleted files from Windows 7.
you can simply drag the selected files or folders to the Recycle Bin. or right-click on a file or folder, then choose the “Delete” command in the drop-down menu and confirm the deletion in a pop-up dialog. The two deleting options mentioned above do not remove objects from your hard drive, but instead move them to Windows Recycle Bin. A computer user can restore those files or folders to their original location at any time. emptying the files from the Recycle Bin. using a “Shift + Delete” direct deletion command to directly remove the objects from your hard drive. or, no matter which method you use to delete the files from a memory card or USB drive connected to Windows 7 PC, the files will be permanently removed. We can list more options of permanent deletion, such as a file too big to be recycled, or deleting files with cleanup tool, but it should be clarified that the permanent deletion mentioned here is from the angle of the operating system and common users. As a matter of fact, the files are not yet permanently erased from Windows 7 computer. Believe it or not, please keep reading if you urgently need to perform Windows 7 file recovery. When you remove files on Windows 7 with the so-called permanent deletion methods, the system just marks the memory space as available for new data. Until new data occupy the space, it is still possible to recover deleted files from Windows 7 computer. The utility that we need for Windows 7 recovery is a good data recovery software. 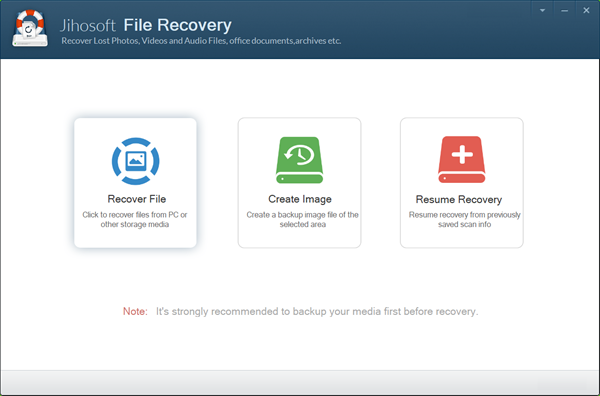 Jihosoft File Recovery, an advanced data recovery software, is specially designed to recover deleted files from Windows 7, which also works for Windows 10 file recovery of course. It can perform selectively scanning to find directly deleted files (Shift + Delete) or files emptied from the Recycle Bin. Selectively scan for files in various formats so as to speed up the scanning process. Recognize both computer hard drives and removable disks, like memory card, USB flash drive and external hard drive. 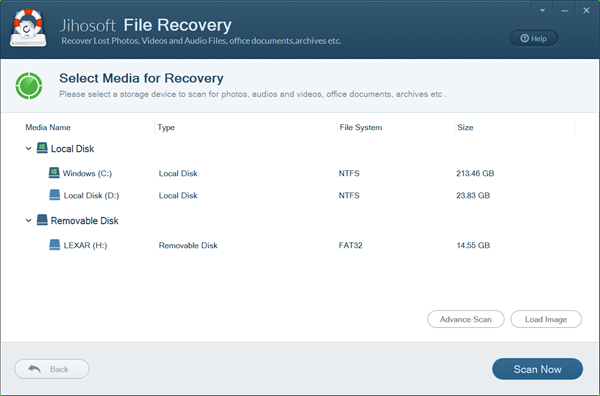 Support the recovery of photos, videos, audio, documents, archives, etc. Allow free preview before recovery, in multiple view modes and filtering options. Recover Windows 7 files in good quality and well organization. Create Image feature can make backups for disk drives. Note: In order to maximize the chance of successful Windows 7 file recovery, please do not save any new files onto the hard disk drive where your files were deleted from immediately. Otherwise, it may result in overwriting of lost data and make the Windows 7 deleted file recovery become impossible. Free download and install the data recovery software for Windows 7 on your computer. If you want to recover files from a removable disk, please connect it to your PC. Follow the steps below when you’re ready. Once the program is installed, it should open itself. If it is not launched, please double-click the icon on the desktop. Click Recover File to proceed. You can try other functions later. Select the partition you are going to recover deleted files from, then click Advance Scan button and tick the file types that you need. Click Scan Now button to proceed. When the scanning is over, all the file types will be displayed in the left panel by categories. You can click on any file type to view specific files on the right panel. Click Recover button to undelete the files you need. Note: The button on the right can switch view modes between list and icon, and the Filter button on the top-right can help you find wanted files quick by size. 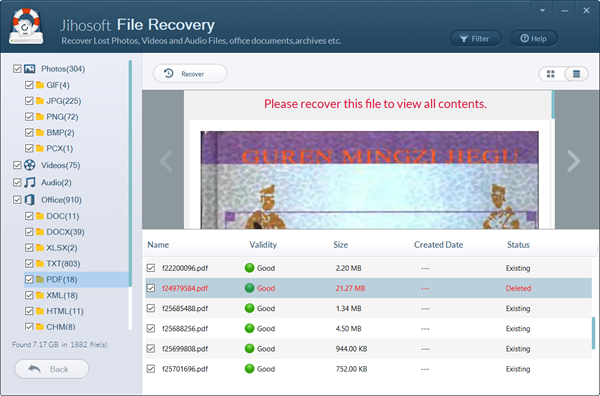 When the recovery is finished, you will be able to check the restored files in separate folders. Do remember to move them to somewhere safe. Though the Windows 7 file recovery tool is able to retrieve lost files, you’re suggested always back up your most precious data. Share with us your problems and solutions of data recovery and backup by leaving a comment!